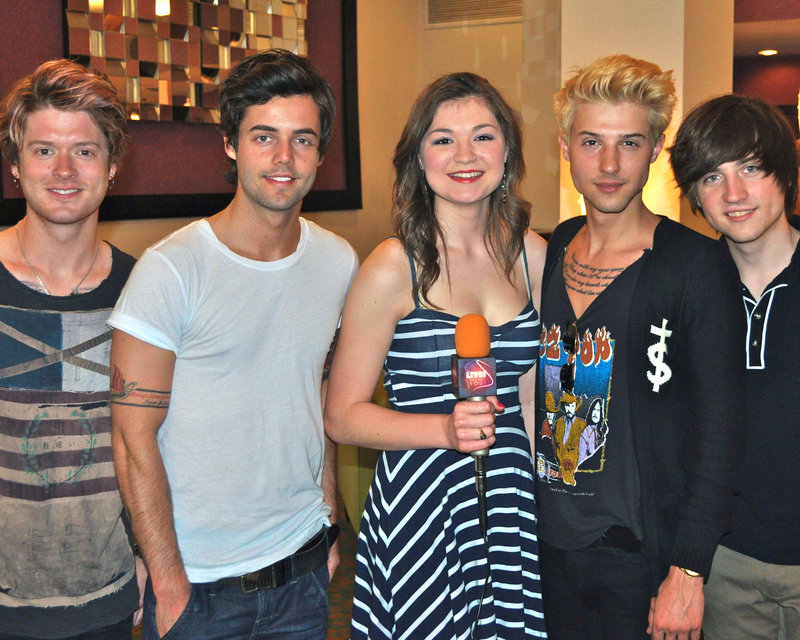 LSY up close: Talking “Tonight Tonight” and more with hit-makers Hot Chelle Rae – Live! Starring ... You! When a toothbrush plays your song, you know you’re a big deal. Which means Hot Chelle Rae is undeniably hot in the music industry right now. You probably know the four-piece rock band from Nashville. But even if you think you don’t know them, believe me, you do. For starters, their smash hit song “Tonight Tonight” – which helped them win New Artist of the Year at the American Music Awards – is a summertime anthem and a year-round party song. It’s everywhere. Even my 7-year-old’s toothbrush plays it — for exactly two minutes, “to encourage longer brushing,” according to the marketing materials. But there’s more. The four-member pop-rock band from Nashville has three albums, a combined 676,000 Twitter followers, and a presence in places that even they don’t expect. When LSY reporter Jessica Wojcinski and I met the band before their concert for WPXY in Rochester, New York, lead guitarist Nash Overstreet told us that he was in an elevator at The Palms casino in Las Vegas with Alexander DeLeon, lead singer of The Cab. Nash and Alex were talking about the differences between their bands’ first two albums. When the elevator door opened, they stepped into the lobby – and a Hot Chelle Rae song called “The Distance” was playing. In a casino? Nash thought to himself. This is a ballad! 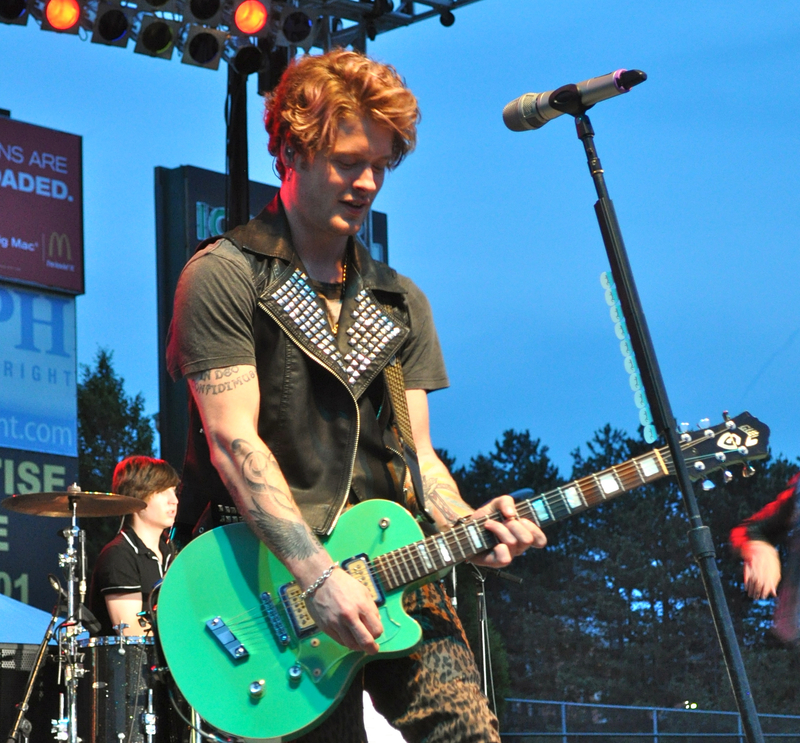 And it’s one more sign that Hot Chelle Rae is hot on the music scene. Here is an edited version of Jessica’s conversation with Nash, lead singer Ryan Follesé, bass player Ian Keaggy and drummer Jamie Follesé. Jessica: What would you consider to be your “big break”? Nash: I think having “Tonight Tonight” come out and skyrocket the way it did. It was a little of a slow go at first, but it just kept going and going. It was our first top 10 hit. That brought so many fans we hadn’t had before, and it was the start of everything else that has happened. Ryan: I definitely agree with that. It was a huge, huge, awesome thing for us. And winning an American Music Award was a big deal for us. It still is a big deal. Ryan and Jamie Follesé’s dad is a well-known songwriter in Nashville. Jessica: All of you have professional musicians in your family. (Editor’s note: Ian’s dad Phil Keaggy is a guitarist; Ryan and Jamie’s dad Keith Follesé is a songwriter; and Nash’s dad Paul Overstreet is a singer-songwriter.) How has that impacted where you are today? Ian: They gave us the opportunity to grow up around music. We grew up playing music. Our parents were songwriters and musicians. We didn’t get jaded, but we’re used to being in this scene. We could ask them questions. If we were writing a song, we could bounce ideas off of them and say, “What about this?” and get their input. Jessica: There are a lot of people who would saying being a professional musician requires being in the right place at the right time. What do you think? Or we actually just worked hard and practiced a lot. Either way. Nash: Every time we play in the rain, snow, sleet or hail! Jessica: In one of your first interviews, you said that your songs are like your children. So, if you love them all, how do you decide which ones get on an album? Nash: Whichever ones obey the most. We’ve got the little brat children. We love them the same, but you’d prefer for them to stay in their room for time out, and then the other ones you love and you want to bring them out. It’s the ones we like playing the most, and the ones our fans like hearing the most. We’ll do a lot of experimentation. We’ll play a song live before we release it so we know how they’ll react. Jessica: As songwriters, what’s it like to put your emotions out there for people? Ryan: It’s so different from acting – or anything like that – as an art form. I find great pleasure in putting something out there for people and letting them see a side of me that is personal. It’s an extension of you. The reason we do music is it makes you feel alive. Jessica: Is there anything you wish your fans knew about you that they don’t? Nash: I feel like we let them know way too much via our music to have something they don’t know. We write about all kinds of life, whether it’s getting drunk at a party, or falling in love, or crying because you miss someone, or making out in an elevator, or whatever it is. We’ve kind of covered it all. We just keep writing about what we do, where we go, and the places we visit. Ian: And if they don’t find out about it via a song, they find out about it via Twitter. Jessica: Speaking of Twitter, how do you keep up with your fans? You must get way too many tweets to answer them all. Jamie: You can go through your timeline and tell which people are trying to get you to respond just because they want a response, and which people are asking you a legitimate question. When you see something like that, it makes you want to respond a lot more. 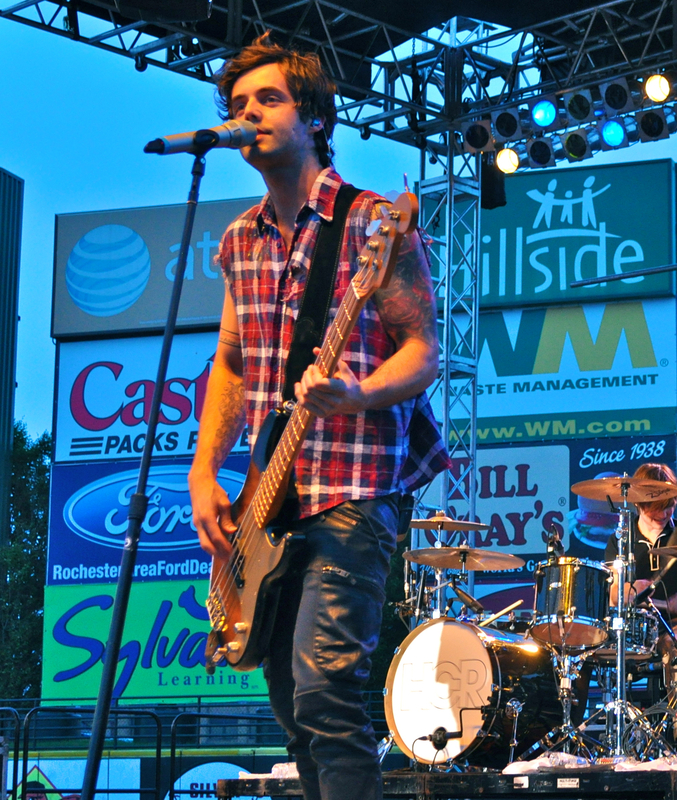 Ian Keaggy performing in Rochester, New York at WPXY’s Summer Jam. Ian: Sometimes people will say, “You didn’t reply!” and it’s like, “I’m sorry.” They’ve got to understand there’s a lot there and we try to talk to our fans as much as possible. Ryan: I don’t check my mentions as much as I feel like they think I do. But I don’t get on my Twitter that much either, I guess. Jessica: What advice were you given as aspiring musicians, and what advice would you give? Ryan: I think we were all given great advice from our parents, mainly because our parents all made it in the music industry, and they were very driven and don’t really take no for an answer. That’s important to know: If you’re going to pursue music, you’re going to hear that word a lot. You’re going to hear “no” all the time. Way more than you’ll ever hear yes. It’s very important to be persistent and continue on and focus on the craft of writing songs, and know that if you’re not dedicated, you can’t do it. You won’t do it.